News flash -- shoes are still a big deal. I went to a 60th birthday party this past weekend and the guest of honor got a custom-made pair of shoes from her daughter, a shoe designer for a major brand. What got all the attention? The fancy cake? The jewelry? The beautiful flowers? Nope! The shoes, of course. Other items may come and go, but shoes have staying power -- even if they cost a week's pay. Men can love shoes too. To be balanced, I developed a love of well-made shoes in my pre-teens when I attended a military academy (think Catcher in the Rye) and had to polish them every day. Some 50 years later, and one of the first things I notice when I am introduced to someone new is how they take care of their footwear. But shoes and accessories are a big, big business. We want to focus on the shares of Michael Kors (KORS) today and leave the designs for the trade magazines. We last reviewed KORS back in February, and it was struggling on the charts. 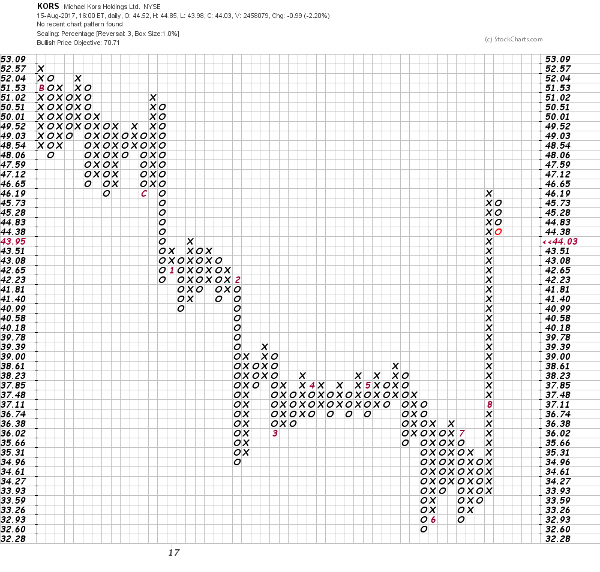 We noted then: "In this Point and Figure chart of KORS we can see how little support there is at $35. A new low for the move down opens up $31 as the next downside price objective." By early June the support at $35 gave way and prices approached $32. With KORS now trading up in the mid-$40s a fresh look is warranted. In this daily bar chart of KORS, above, we can see that the price and indicators of KORS began to improve in June and July, as buying interest materialized in the $34-$32 area and the On-Balance-Volume (OBV) line turned up. A rising OBV line is a sign that buyers of KORS were acting more aggressively and trading more shares on days when the stock closed higher. Things changed dramatically in late July and this month, as prices closed above the 50-day moving average line and its slope turned flat. Then we made a big upside price gap on heavy volume. KORS gaped above its highs going back to January and above the declining 200-day average line. Now the slope of the 200-day line is turning flat. The OBV line has moved higher with the price action and momentum is not diverging from the price action. In this weekly bar chart of KORS going back three years, above, we can see how prices rallied above the 40-week moving average line. The weekly OBV line shows improvement over the past month and the Moving Average Convergence Divergence (MACD) oscillator has turned up towards the zero line. Prices are on a stronger footing, but there still is a significant amount of overhead resistance in the $45-$60 area. Price gaps disappear in this Point and Figure chart of KORS, above. This chart shows the big runup this month (look for the "8" on the chart). A potential longer-term price price of $70.71 is shown. Bottom line: If KORS is going to keep climbing, it should make a high-level consolidation now -- and not pullback to fill the price gap. A $43-to-$47 trading range would be ideal, along with a rising OBV line. Once KORS has built a big enough base ,it should try to continue the rally. I would look to trade KORS from the long side when it has shown that buyers are willing to accumulate shares at this new and higher price point.